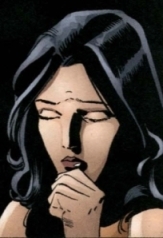 Powers/Abilities: Jessica Drew possessed a keen intellect, as evidenced by her work as an espionage agent and private eye. While she previously possessed a wide range of spider-powers, due to youthful exposure to an arachnid serum, those powers faded, and she became a normal human once again. (Spider-Girl#39 (fb)) < decades before the main story > - Jessica was exposed to a lethal dose of radiation as a child. To cure her, her father injected her with a serum of irradiated spider's blood and encased her in a stasis tube. (Spider-Girl#39 (fb), 40 (fb)) <25+ years before the main story> - Jessica emerged from the stasis tube some decades later, now a teen-ager. She possessed spider-powers, and temporarily took the name Spider-Woman. (Spider-Girl#39 (fb), 40 (fb)) <20-15 years before the main story> - Jessica's powers eventually faded, and she retired from heroics, becoming a private eye. The Spider-Woman identity was taken over by Julia Carpenter and (later) Mattie Franklin. (Spider-Girl#39 (fb)) <16 (approx.) years before the main story> - Jessica married Jerry Hunt, a former boyfriend. (Spider-Girl#39 (fb)) <14 (approx.) years before the main story> - Jessica and Jerry Hunt had a son, Gerry, who was diagnosed with rare blood disease. Trying to save him, Jessica submitted her son to the same treatment that had saved her. (Spider-Girl#40 (fb), 42 (fb)) - After years of treatment, Gerry emerged with spider-like powers, although his disease was not cured. (Spider-Girl#33) - The copy-cat Spider-Man (identity unknown at the time) returned home, where he recounted the day's events, including a battle with Spider-Girl, to his mother (face and identity unrevealed). She implied that she knew something about Spider-Girl's real identity, and assured her son that he was "destined to be the next Spider-Man." (Spider-Girl#34) - At his home, the copy-cat Spider-Man complained to his mother about losing a battle with Spider-Girl; she said that she would check with a friend in order to find out Spider-Girl's real identity. The copy-cat vowed confront Spider-Girl and get even. (Spider-Girl#35) - The new Spider-Man continued to complain about Spider-Girl, and revealed that his mother once had a costumed identity as well. Saying that she was going to contact an "old friend," his mother called the Parker home, but could not get through to anyone. (Spider-Girl#41) - From the television news, Jessica learned of the death of Crazy Eight, accidentally killed in battle with her son, Gerry, and Spider-Girl. She went to discuss it with Gerry, but he had left the house. (Spider-Girl#42) - While at home, worrying about her son, Jessica was visited by Julia Carpenter and Peter Parker. They revealed that they knew about Gerry's Spider-Man activities, and his illness, and asked after his whereabouts, but Jessica did not know where he was. Jessica blamed herself for Gerry's disease; when Peter suggested taking him to Reed Richards for a cure, she was very pessimistic about the chances. (Spider-Girl#43) - Peter Parker, back in his Spider-Man guise, convinced Gerry Drew to retire from heroics and seek treatment with Reed Richards. Jessica thanked Peter profusely, telling him to pass it on to Spider-Man, and then accompanied her son to his treatment. Comments: Created by Tom DeFalco, Pat Olliffe, John Livesay. 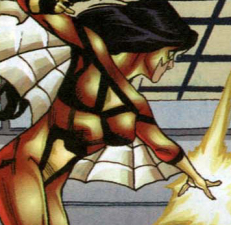 Jessica can be seen in her Spider-Woman costume in a cameo and on the front cover of Spider-Girl#60, as part of the montage of female heroes who inspire Spider-Girl. Jessica's parents are never seen, nor named, in the MC2 Universe; however, her origin story is revealed to be the same as the 616 version, and her father is mentioned. I am presuming that this version of Jessica would have the same parents, since the MC2 is supposed to be an alternate future of the regular Marvel Universe. Whether or not those parents are deceased, as in 616, is unknown, however. The timeline for the flashback events is based upon events shown in Spider-Girl#49. There, it is established that the new-born infant, May Parker, was returned to her parents on the same night that her father interrupted Norman Osborn's Gathering of the Five ceremony, where Mattie Franklin gained her Spider-Woman powers. Since Jessica is shown retiring from heroics in the presence of a costumed Mattie, this retirement has to occur after the previous event. Finally, since Mayday Parker is about 16 at the time of these later stories, the time-frame for other events is based on that. Gerry's age is never established, but he must be a few years younger than Mayday, making him about 13-14. Ex-husband of Jessica Drew and father of Gerry (Spider-Man). Former SHIELD agent. When his son was born with a rare blood disease, he blamed his wife, and abandoned the family.